The hope is that Day 6 will be the final day…the last 44.8 miles of a 351-mile pilgrimage on the Caminho Da Fé…the final miles for Charlie, a guy who has had a lifetime full of highs and lows, to become a Pilgrim. 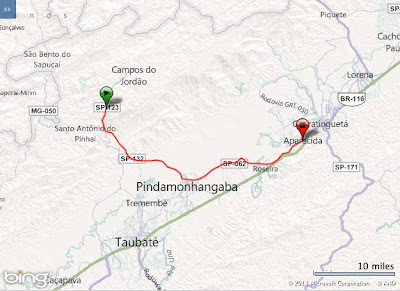 Day 6 will begin in Campos do Jordão and pass through Piracuama and Pindamonhangaba on the way to the final destination of Aparecida. Pindamonhangaba, affectionately known as the “Princess of the North”, is known for its beautiful and historical landscapes and rich culture. A particularly annoying section that is covered entirely with large rocks will surely be a challenge to tired legs and sore feet. I recall cursing repeatedly during that portion in 2011 – the only portion of that journey where I recall Chris being unhappy and crabby. Then there is the "active" railroad section. The last 50k is super challenging – it is entirely on heavily trafficked highways. Aparecida, home of the patron saint of Brazil, Our Lady of Aparecida, marks the end of the Caminho Da Fé. Currently housed in the Basilica of the National Shrine of Our Lady of Aparecida, it is represented by a short, wooden statue of the Virgin Mary. Aparecida has a hot climate with dry winters. The municipality depends exclusively on tourism generated by the devotees surrounding the statue of the Virgin Mary - it receives more than 7 million tourists a year making it the most popular pilgrimage site in Latin America.